"We've seen solar prominences before—but never quite like this," says Alan Title of Lockheed Martin, principal investigator of the Atmospheric Imaging Assembly (AIA), the observatory's main telescope array. "Some of my colleagues say they've learned new things about prominences just by watching this one movie." "SDO is our 'Hubble for the sun'," she says. "It promises to transform solar physics in the same way the Hubble Space Telescope has transformed astronomy and cosmology." "No solar telescope has ever come close to the combined spatial, temporal and spectral resolution of SDO," adds Title. "This is possible because of the combination of 4096 x 4096-pixel CCDs with huge dynamic range and a geosynchronous orbit which allows SDO to observe the sun and communicate with the ground around the clock." 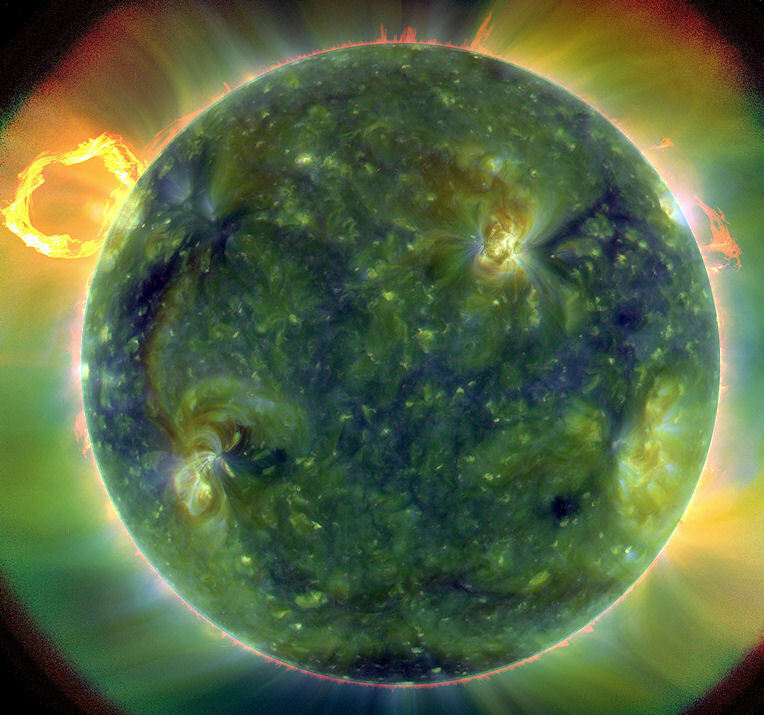 A full-disk multiwavelength extreme ultraviolet image of the sun taken by SDO on March 30, 2010. False colors trace different gas temperatures. Reds are relatively cool (~60,000 K); blues and greens are hotter (> 1,000,000 K). One of the most amazing things about the observatory is its "big picture" view. SDO is able to monitor not just one small patch of sun, but rather the whole thing--full disk, atmosphere, surface, and even interior. "We're going to make connections that were impossible in the past," says Title. 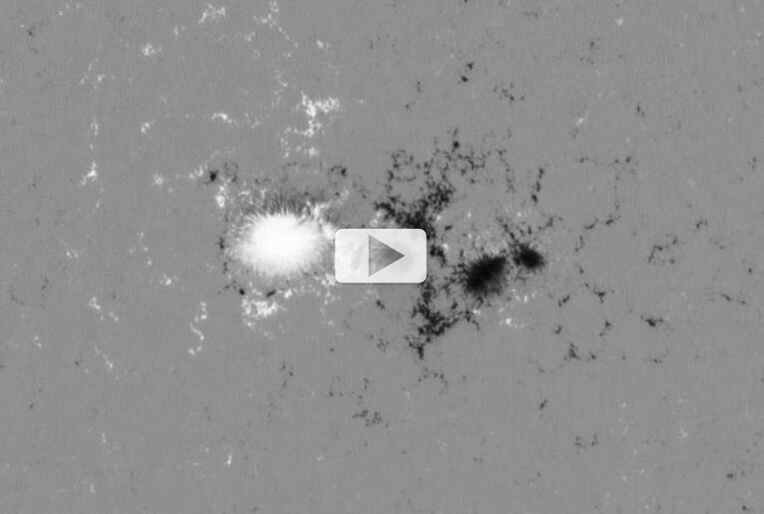 With SDO looking on, decaying sunspot 1060 unleashed a minor "B3-class" solar flare. 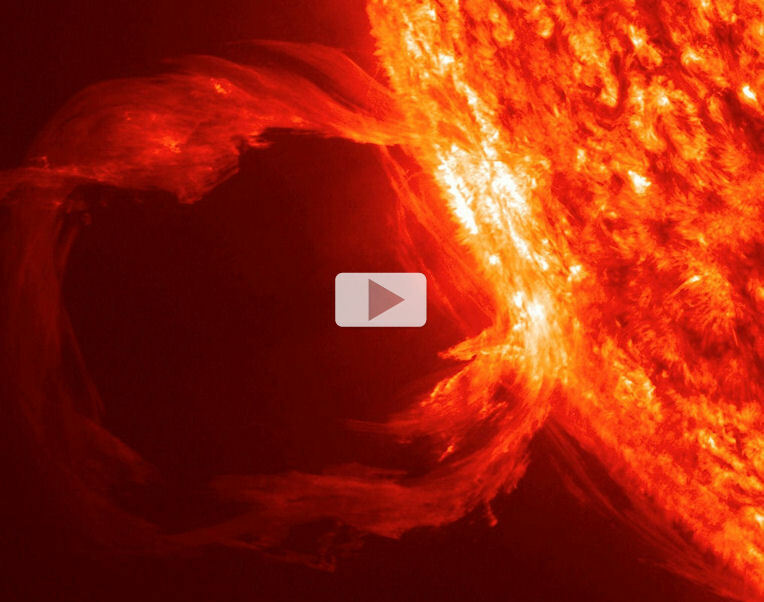 A shock wave issued from the blast site and raced across the surface of the sun (movie). SDO images clearly show magnetic loops and other structures rocking back and forth when the wave passes over them. Eventually, the wave disappeared over the sun's horizon--but the show wasn't over. Four hours after the initial blast, and some 200,000 km away, a massive prominence erupted. Coincidence? Not according to Title. "As the wave swept across the surface of the sun, it de-stabilized magnetic fields it encountered en route. I believe the magnetic underpinnings of the prominence were upset by the wave, and this led to the eruption." A seemingly insignificant B-flare triggered a massive prominence eruption halfway across the sun. This is the sort of unexpected connection that, when fully understood, could lead to big advances in space weather forecasting. 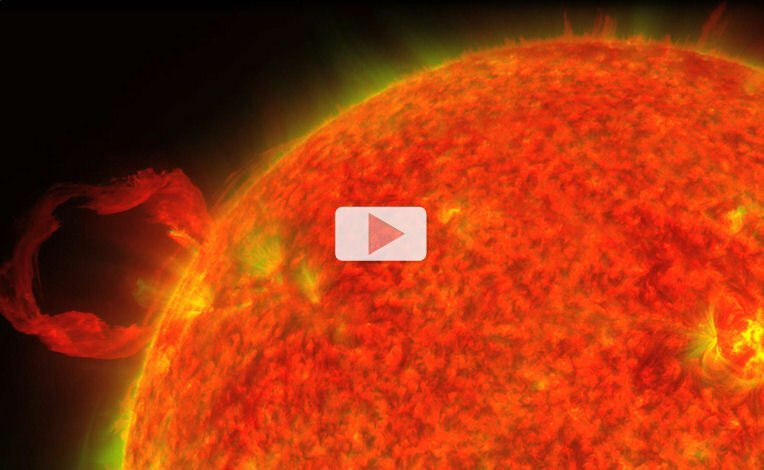 On April 8th this active region unleashed a B3-class solar flare. Click on the image to view an 8 MB movie of the flare and the subsequent shock wave that went rippling through the sun's atmosphere. 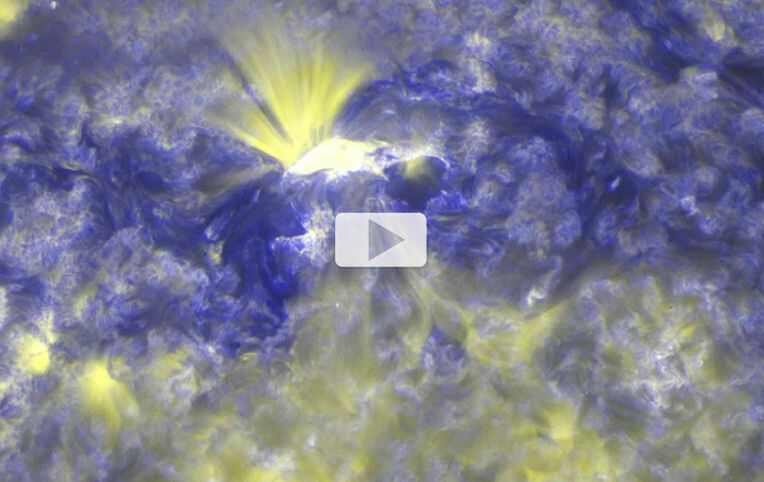 So far, SDO's prettiest pictures have come from the bank of telescopes called AIA. Other instruments on the spacecraft are working just as well—and they promise similarly exciting results. "The Helioseismic Magnetic Imager (HMI) is performing splendidly," reports HMI principal investigator Phil Scherrer of Stanford University. "We're getting very high-quality, high signal-to-noise data." HMI is designed to look inside the sun using a technique called helioseismology. Just as geologists use seismic waves to map the interior of our planet, solar physicists can use acoustic waves to map the interior of our star. On the sun, acoustic waves are generated by the sun's own internal motions. HMI detects the waves pulling the sun's surface back and forth, revealing indirectly what lies within. "We're processing the data now," says Scherrer, "and soon we expect to have some nice maps of the sun's interior." The Extreme UV Variability Experiment (EVE) is online, too, "and we're getting great data as well," says principal investigator Tom Woods of the University of Colorado, Boulder. EVE monitors the sun where it is most variable—in the extreme UV part of the electromagnetic spectrum. At these wavelengths, the brightness of the sun can rise and fall a hundredfold in the blink of an eye, heating and "puffing up" Earth's upper atmosphere, and dragging down satellites. EVE measures these changes with unprecedented time and spectral resolution. "EVE has already detected a number of very interesting solar flares," says Woods. "We're excited; the flares evolved in a way we didn't expect. This is something we wouldn't have seen without the capabilities of EVE." He plans to offer more details at a later date when the EVE team has had time to fully analyze the data. Mission scientists stress that all of this is preliminary. The observatory is still being commissioned, and a good deal of testing and calibration remains to be done before regular, daily images become available in mid-May. Even more effort must be put in before hard science appears in refereed journals. "First Light is just a first look," says Pesnell. "The best is yet to come." A complete gallery of SDO's First Light images and data may be found at http://svs.gsfc.nasa.gov/Gallery/ SDOFirstLight.html.